If you get a chance to go to the Gilroy Garlic Festival, (held annually in Gilroy, California during the last full weekend of July), you’ll no doubt be lured to the Garlic Ice Cream they offer to the public for free. But get there early. The line for that ice cream stand is enormous! Really ENORMOUS!! Garlic ice cream? What can it taste like? We’ve just got to know! However, when you get your cone, it is wee high; barely a smattering taste of it. But, maybe just enough to make you want some more. Understandably, such a radical combination of garlic with ice cream has not yet made it in the dessert section of your local grocery or market. But, no problem. You can make your own!! 1. Over medium heat, bring the milk, garlic and vanilla to a boil; remove immediately and set aside. 2. Mix the cream, sugar and egg yolks until smooth. Using a sieve, pour the milk mixture into the egg and sugar mixture, whisk briskly. 3. In a saucepan, on low, and stirring constantly, heat the combined mixture until it thickens somewhat (10-12 minutes). Do not boil. 4. Place in a bowl and chill. Pour into an ice cream machine and churn. Freeze and serve! Approximately 40 minutes preparation. Makes 1 quart. Happy Garlic Ice Cream eating!! 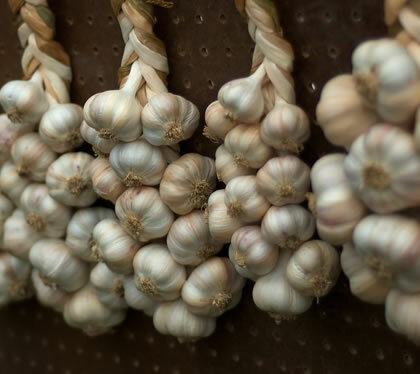 Previous post: Garlic, the Ultimate Antibiotic – The Superbug Killer! Next post: Vampires Hate Garlic Blood! Mosquitos do too! !